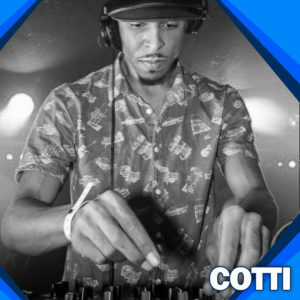 Producer/Artist & DJ born & Raised in Brixton, South London, Cotti aka Don Cotti has been involved in the Dubstep/Grime scenes since 2004 with Classic tracks such as “Sensi Dub”(#No 4 in UKG chart may 07) “I Don’t Give A Dub”(Championed by Mala/DMZ) “Calm Down ft Doctor”(Sold 2k vinyl) & “Rise The Temperature ft Doctor” with the latter being the debut release on Chase & Status’s label MTA Records in 2009. Cotti also runs 2 labels “Sumting New”(2010) & “Bun a Badmind” distributed by VP Records VPal, Cotti has been releasing Bass music for over 10 years now both on vinyl & digital with releases from Championed artist such as Skepta, P money, Jammer, El B & Coki & himself. Collaboration wise Cotti has had the pleasure of working with other established musicians such as Skream, Dub Pistols, P Money, Coki(DMZ), Skepta, Kromestar, Nitin Sahwney, Newham Generals & has even reWorked the famous Massive Attack. Back in 2007 Cotti also had His track “The Legacy” included on Caspa & Rusko’s Fabric Live 37 CD. This Cd had a massive impact on the Dubstep scene and really helped to propel The DUBSTEP GENRE into the mainstream’s sites. More recently Cotti had his Track “End of da road” feature on Ministry of sound’s “Dubstep & Beyond” compilation album along with the likes of Skrillex, Flux pavillion, Doctor p, Skream, Benga & more. previously In 2006 Cotti featured on Dj Cameo’s BBC1xtra show with his crew at the time, this was his first taste of legal radio after 2 years of grinding on pirate radio stations like Rinse.fm & Ontop.fm and building his name as a DJ.Producer. By 2007 Cotti landed a live guest mix for KIss100 DJ Hatcha & Crazy D’s Dubstep Show which he appeared on least 4 times over the years. In 2008 Cotti was then asked to come and do a live mix for ‘Mary Anne Hobbs’ Who at the time was pioneering underground electronic music on BBC Radio 1, Cotti took this opportunity to showcase his music to the next level and started to get paid remixes from some established labels like Virgin Records, Relentless Records, Cooking Vinyl, Sunday Best. In 2008 and 2009 Cotti had the pleasure of touring both Australia & New Zealand promoting the releases he had on Australian Label ‘Aquatic Lab’ (2008) and Chase & Status label ‘MTA Records’ (2009) where he also guested on numerous radio stations & blogs. By 2011 Cotti finally made it stateside after putting it off for 3 years, he played 8 different Cities including NYC, LA, Houston, Philly, Seattle, Denver, J.City TN & San Hose where his fans response was even greater than he expected. While out there in the US Cotti got to chill out with EDM producers like 12th Planet & the smog crew, after which he was ask to release an EP for Smog Records which dropped in 2014, Cotti has since been back to the states in 2012 where he did another tour and round of radio promo spreading his reggae Dubstep vibes.